Whether you’re a recent college grad or a seasoned professional looking for new opportunities, it never hurts to take a look at your résumé. It is your introduction to a possible future employer, so you want to give a great first impression. Here is a list of some common résumé mistakes that you can look for before you hit ‘submit’ on that job application. Something as simple as a spelling or grammar error could cost you the job. Make sure to triple check every résumé that you send. It’s also a good idea to have a couple of other people take a look, because they may find something you didn’t notice. If you are still using ‘doglover1@email.com,' it’s time to get a new email address. A professional email contact should be just your name and maybe a number or two if you have a common name. Also, make sure the voicemail to the number you list on your résumé is professional. As cute as your child telling the caller to leave a message is, it doesn’t come across as professional. Trying to shoehorn unnecessary information into your résumé can bury the important stuff. You don’t have to include that high school retail job or that summer you spent mowing lawns. If you are a new graduate, you aren’t expected to have an extensive résumé, so keep just the important information. Also, don’t include things like hobbies or interests. 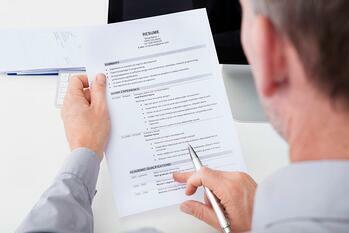 A résumé is just for career information; the employer will get to know you in an interview. Every résumé you send out should be customized to fit the job for which you are applying. Figure out how your experience fits into the duties and word it as appropriate. While this does take extra time, it highly increases the chances of your résumé being seen, scoring an interview, and landing that job. On average, an employer will spend about 6 seconds looking at your résumé. If they can’t easily find information such as your education, current job, or other applicable information in the time, don’t expect a call anytime soon. Make sure there are bold headers and bullet points to separate information. This is simply a waste of valuable space. It’s assumed that you have references so you don’t need to tell them. If an employer would like to see you references, they will either note that in the application or ask for them later. It’s all about how you present your information, not the amount. White space is your friend on résumés. Don’t make font too small in order to jam in more information. Ideally, font should never be smaller than 12 point. Always assume a cover letter is required for every job for which you apply. Many HR managers won’t even look at your résumé if a letter isn’t included. Write a cover letter for each application you submit. Yes, this is time consuming and can feel redundant, but it will all be worth it when you land that job.